The Good and the Bad of this past week. It’s Friday. So we close out the "Week That Was" with our latest volume of… "Cheers and Jeers!" This week, I give a fatherly pat on the back to Baumer, Goon and the STREAKBREAKER, while I send the Hurricanes, Scott Howson and crybabies to their room without dinner. JEERS to the Carolina Hurricanes for the unjustifiable overpayment of Tuomo Ruutu. Ruutu’s new contract (which will kick in next season) pays the Finn $4.75m for the next 4 years. That’s right. The frequently injured, glorified checking winger will earn close to 5 schmill for the next four years. Ruutu’s best season saw him score 26 goals and 54 points. That was only his second 20-goal season and only the second time he crested 50 points. To give you some context… He will make approximately 2.4 times what Alex Burrows will make, or 95% of what Ryan Kesler (40 goal scorer, Selke winner) will earn. As our man Thomas Drance pointed out several times on Twitter, it’s stupid contracts like this Ruutu deal that make you appreciate how GOOD Mike Gillis is at his job. CHEERS to the makers of GOON. From the feedback I’ve heard and the limited number of quick reviews I’ve read, Goon sounds like it’s decent, funny hockey movie. GOOD! Because the world is full of TERRIBLE hockey movies. In fact, the only halfway decent hockey movie is probably Miracle, and it’s just okay. Don’t even get me going about Slap Shot (you’ll hear more about that on Monday during "You Know What I Hate?!"). Youngblood is so godawfully bad that it’s funny. The Mighty Ducks? Please. Mystery, Alaksa? Get outta here. So Goon has a real shot at being a lasting, oft-referenced, quality hockey flick. It’s about time! JEERS to Scott Howson and the Blue Jackets organization. Jeers to Howson for making a terrible trade yesterday, exchanging Jeff Carter for Jack Johnson and a conditional first round pick from the LA Kings. Jeff Carter is a guaranteed point producer, averaging around 35 goals and 30 assists per year. He was understandably miserable in a toxic environment on a horrible team. While offensively talented, the jury is still out on Jack Johnson’s defensive capabilities, actually it’s not: he’s really bad. I know that +/- is usually a useless stat, but he is a career -90 with the Kings. For you statties, Jack Johnson has had the worst CORSI-ON and Relative CORSI for any Kings defensemen for the last 4 straight years, without playing the hardest competition. The bottom line is that Howson very incorrectly believes that Johnson is a solution to the Blue Jackets’ defensive woes. WRONG. And a bigger jeers to the Blue Jackets organization for continuing to employ this knucklehead. It’s just so clear that he doesn’t fully understand how to generally manage an NHL hockey team. That organization is in total ruins right now. CHEERS to Alex Burrows, who is now becoming known as STREAKBREAKER. He famously broke the Canucks 9-game losing streak with a shorthanded goal against Carolina during the 2008-09 season. Last night, Burrows had a chance in the third round of the shootout to end the game. With all 5 previous shooters coming up empty, Burrows gave his patented forehand-to-backhand-top shelf to win it for the Canucks and end the Red Wings NHL-record 23 game home winning streak. I like the moniker "Streakbreaker"… it’s a much better nickname than Bitey. 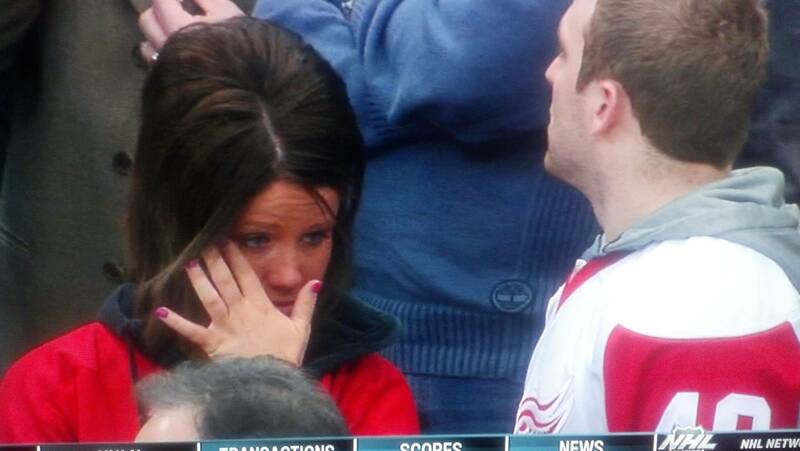 JEERS to the female fan in Detroit last night who was caught CRYING on camera after Burrows ended the Wings streak. REALLY?! You were THAT distraught that your home team finally lost a game that you started crying?! Is it really that devastating that the Wings lost for the first time at home since November that you were brought to tears?!?! The Red Wings are still first overall in the league, picked up a point during the skills competition shootout, and played one of the best games of the season AND YOU’RE CRYING?!?!?! Lady, this was game 62 for the Wings. They still have 20 more games before the playoffs even start. Save your crying for when the Wings are knocked out of the playoffs in the first round. Or when your Amway purchase fails to arrive on time. CHEERS to Nolan Baumgartner, who plays his 1000th professional hockey game tonight for the Chicago Wolves. Baumer is a well journeyed, well respected player, clearly loved by all his current and former teammates. He’s currently in his second stint in the Canucks organization, and the Wolves captain is leading his AHL club to a great record while tutoring young players as they make their way to the NHL. Big kudos to you, Baumer. You’re a gem.